TWSMRT operates three purpose built vehicles. The Control vehicle (CONTROL) is based on an Iveco van and has a side door entry to the control area which acts as a portable control room from which the team manage most of it’s operations. 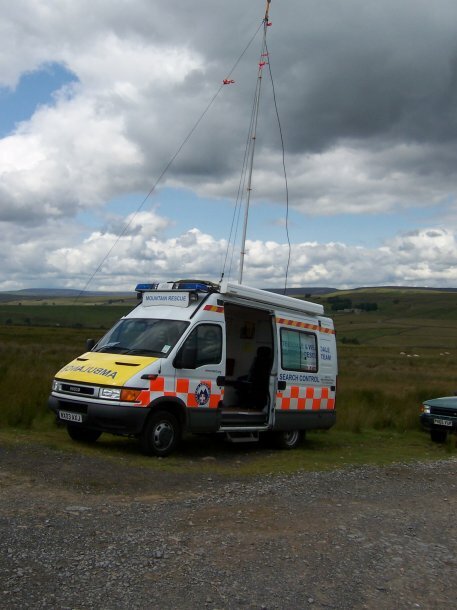 It is equipped with a range of radios for communication with search groups, helicopters, other teams and the police. There is also a computer system that allows for logging of all information collected during a search. The back of the vehicle is used for storage and is separated from the control area by a steel bulkhead. The storage area is large enough to accommodate a portable generator, the pump for the vehicle's pneumatic radio mast and a selection of search, rescue, medical and climbing equipment. The vehicle can also be used as an ambulance for transporting a casualty on a stretcher. The other team vehicles are long wheel base Land rovers. 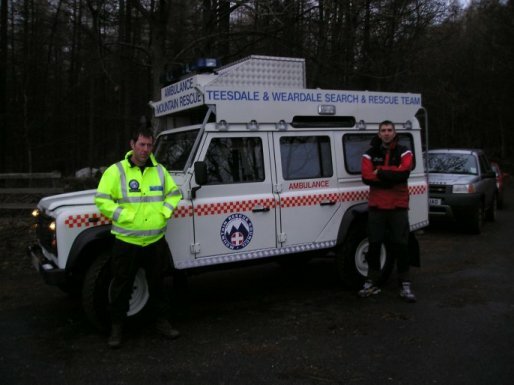 These vehicles are mainly used to transport search groups and kit around the search area. They have a similar radio fit to Control and if necessary can also be used to manage a second search operation. Again these vehicle can quickly be configured to carry a casualty on a full length stretcher for transporting either to hospital or from rough terrain to a tarmac road for hand over to a NHS ambulance. As with all team equipment a great deal of fundraising was required to purchase these vehicles and the team gratefully acknowledges the generosity of all those who donated money for their purchase. One of the land rovers is known as 'Stan's Van' in recognition of the 25 years of service given to Mountain Rescue by Stan White who died in 2002 and was for many years the team secretary.